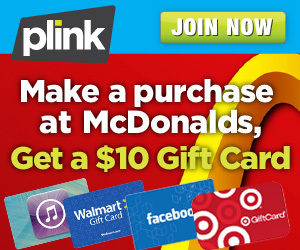 Plink - You Gotta Sign Up! I have mentioned Plink in the past. It is yet another great way to earn freebies! If you are not yet a member now is the time. They have a great offer running through this Sunday. Sign up HERE and then make a purchase at McDonald's by this Sunday and you will get $10 in your account which you can then convert into a free gift card! Plink works by tracking your purchases, so you will have to give them your bank account information, but I promise it is legit and secure. I have been a member for almost a year and never had an issue. You choose stores that you shop at frequently and whenever you make a purchase you get points, so easy!